↑ Los Angeles is one of the Global city of media, business, and International trade. It is the second most-populous city in the United States. It is also the home to renowned institutions covering a broad range of educational and professional fields, and it is one of the most substantial economic engines of the United States. Los Angeles (and its Hollywood district) lead the world in producing entertainment such as Film, Television, and recorded music. ↑ San Diego sits in the extreme south of California on the border with Mexico. The city has miles of beaches and a number of U.S. United States Armed Forces facilities as well as the world's busiest land border crossing. It is known as "the birthplace of California" since it was the first European landfall and the first European settlement in present-day California. 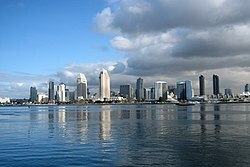 Although it is a large city, San Diego doesn't encompass headquarters of very many large corporations. Instead the city's economy largely relies on US defense and military-related industries, tourism, and some international trade. It is home to a number of institutions of higher learning, including the University of California, San Diego, the University of San Diego, San Diego State University, NewSchool of Architecture + Design, and Point Loma Nazarene University. ↑ San Jose was founded on November 29, 1777, as one of the first towns in the Spanish colony of Nueva California, which later became Alta California. ↑ The town of San Jose served 1849-1851 as the first state capital, when California gained statehood in 1850. ↑ After more than 150 years as an agricultural center, San Jose grew due to demand for housing from soldiers returning from World War II, as well as the city's aggressive expansion policy during the 1950s and 1960s as it annexed large portions of land area which helped increase its population. By the 1990s, San Jose's location within the then-booming local technology industry earned the city the nickname Capital of Silicon Valley, and it hosts several prominent technology companies including Adobe Systems and Cisco Systems. San Jose is home to the National Hockey League's San Jose Sharks in addition to Major League Soccer's San Jose Earthquakes, as well as San Jose State University. ↑ San Francisco is a popular international tourist destination renowned for its beauty, cosmopolitan flair, steep rolling hills, and eclectic mix of Victorian and modern architecture. The city is surrounded by water on three sides and has many famous landmarks, such as the Golden Gate Bridge, Alcatraz Island, Palace of Fine Arts, the cable cars and Tram, Coit Tower, and Chinatown. The city is well known for its left-wing politics and its diverse population, including large and long-established Asian American and LGBT communities. It is the most densely populated major city in California and is the second most densely populated major city in the United States, only after New York City. It is also the only consolidated city-county in the state of California. San Francisco is also home to the largest social media, technology, and Bio Tech industries in the world. The City is also ranked the most expensive city in the United States and stands third in the world. ↑ Fresno is at the heart of the San Joaquin Valley, a leading agricultural area of the United States and the world. Fresno is the closest major city to Yosemite National Park and Sequoia National Park. 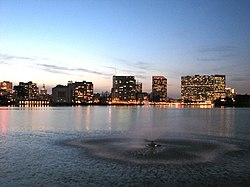 Fresno is the largest inland city in California. It is the home of California State University, Fresno. Fresno is also noted for its large Hmong and Armenian-American communities. ↑ Sacramento has been the state capital of California since 1854. Once the state's second largest city, Sacramento was a major distribution center during the California Gold Rush and was the western terminus of the Pony Express. The American River, where gold was first discovered in California in the middle of the 19th century, flows through the city. In the market boom between 2003 and 2008, the population of the metropolitan area reached close to 2.5 million people as suburbs such as Roseville, California, Lincoln, California, and Elk Grove, California grew, making the Sacramento region the largest region in the California's Central Valley. According to the 2010 census, Sacramento is the nineteenth most-populous metropolitan area in the United States. Sacramento is home to the National Basketball Association's Sacramento Kings. California State University, Sacramento is situated in the city. ↑ Long Beach is a coastal city in the Greater Los Angeles Area metropolitan area. Long Beach partially borders the city of Los Angeles to its west and is home to the Grand Prix of Long Beach and the سانچہ:RMS, which is docked in Long Beach Harbor. The Port of Long Beach is one of the world's largest shipping ports. The city also has a large oil industry; oil is found both underground and offshore. Manufacturers include aircraft, automobile parts, electronic and audiovisual equipment. It is also home to the headquarters for corporations such as Epson America, Molina Healthcare, and Scan Health Care. Long Beach has grown with the development of high-technology and aerospace industries in the area. The California State University system headquarters are in Long Beach, as is the second largest campus of the 23-school system, California State University, Long Beach. ↑ Oakland is a major West Coast of the United States port and is home to several major corporations, including Kaiser Permanente and Clorox, as well as being the corporate headquarters for nationwide businesses like Dreyer's and Cost Plus World Markets. 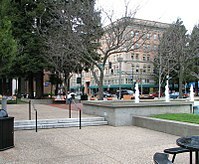 Attractions include Jack London Square, the Oakland Museum of California, the Chabot Space and Science Center, Lake Merritt, the East Bay Regional Park District ridge line parks and preserves, and Chinatown. Oakland is also the home city of three of the Bay Area's major league sports teams—Major League Baseball's Oakland A's, the Oakland Raiders of the National Football League, and the National Basketball Association's Golden State Warriors, with the first two teams playing their home games as O.co Coliseum, while the Warriors play their home games at Oracle Arena. ↑ Bakersfield sits at the southern end of the San Joaquin Valley, an especially Petroleum-rich area of California. Bakersfield is known for its musical achievements such as its own country genre called the "Bakersfield sound". Bakersfield is also in close proximity with the Sequoia National Forest. ↑ Anaheim is the most populous city in Orange County and second largest in terms of land area; it is known for its theme parks (including Disneyland), sports teams, and convention center. ↑ Santa Ana is the county seat of Orange County and home to the famous Bowers Museum, and Discovery Science Center. ↑ Riverside is the most populous city of Southern California's Inland Empire region. Riverside is the birthplace of California's citrus industry and home to the University of California, Riverside (UCR). Its downtown is home to the Mission Inn, one of two historic landmark hotels in California. The Mission Inn Festival of Lights is said to be the third largest Christmas lights display in the nation. ↑ Stockton is at the heart of the Sacramento–San Joaquin River Delta and is sometimes considered the divider between the Sacramento Valley and the San Joaquin Valley. 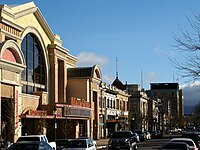 For much of the later 19th century, starting with the Gold Rush, Stockton was one of the largest cities in the state, for a while the third largest city. With a sea port on the San Joaquin River, it was an important agricultural and shipping center, roles which it continues to fulfill. Stockton is the home of the University of the Pacific. ↑ A South Bay suburban city of San Diego, Chula Vista is just 7 میل (11 کلومیٹر) from the Mexico border. It is one of the most economically and culturally diverse cities in Southern California. It is the second largest city in California not near a river (San Francisco is the first). ↑ Irvine is a planned city, mainly developed by the Irvine Company since the 1960s. Irvine is home to the University of California, Irvine (UCI) and to a number of corporations, particularly in the technology sector. 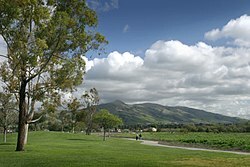 It is regarded for its good schools, jobs and housing by CNNMoney.com, for low crime by the Federal Bureau of Investigation, and the Census Bureau ranks Irvine highly in median income. ↑ Fremont was created as a single city in 1956, from the unification of several unincorporated communities that had historically been small but grew rapidly in the years after World War II. It is located in the San Francisco Bay Area just north of San Jose/Silicon Valley in the East Bay. ↑ San Bernardino is the second largest city in the Inland Empire metropolitan area of California, and the county seat of San Bernardino County, California, the largest county in geographic area in the 48 contiguous states. San Bernardino is home to California State University, San Bernardino (CSUSB) and a number of corporations in addition to the San Bernardino International Airport. 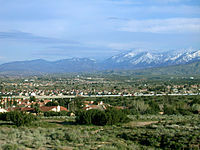 San Bernardino is the gateway to the San Bernardino Mountains, including its ski resorts and numerous lakes. ↑ Modesto is in the center of the Central Valley east of San Francisco and south of the capital Sacramento. The city is surrounded by fertile farmland. Its population is growing fast due to affordable housing in the area and is quickly becoming a bedroom community for commuters to Sacramento, Fresno, and the San Francisco Bay Area. ↑ Oxnard is one of only a handful of cities in the state that is the largest in its county, but not the County seat. It is an important agricultural center, with its distinction as the strawberry and lima bean capital of California. Oxnard has a scenic, relatively uncrowded coastline. ↑ Founded in 1913, Fontana remained rural until a Kaiser Steel mill was built during World War II. The city is now a regional hub of the trucking industry, and home of the California Speedway. ↑ Incorporated in 1984, Moreno Valley lies 65 میل (105 کلومیٹر) east of downtown Los Angeles, just north of Lake Perris. The city is home to the March Air Reserve Base. ↑ This Orange County coastal city is best known for its 8.5-میل (13.7 کلومیٹر) beach. Huntington Beach is often referred to as "Surf City" due to its long association with the sport of Surfing. ↑ Glendale is the focal point of the Verdugo Mountains subregion and is home to a large Armenian-American community. ↑ Six Flags Magic Mountain is just outside Santa Clarita. The city was incorporated in 1987 as the union of several previously existing communities, including Canyon Country, Newhall, Saugus, and Valencia. ↑ Garden Grove is home to the second-largest Vietnamese American community, as well as the Crystal Cathedral. ↑ The largest city in San Diego's North County, Oceanside is home to the longest wooden pier on the West Coast and is directly south of Camp Pendleton, the busiest military base in the United States. ↑ Rancho Cucamonga was incorporated in 1977, as a result of a vote among the residents of the Unincorporated area communities of Alta Loma, Rancho Cucamonga, California, and Etiwanda. ↑ The city was ranked #42 in 'Money's "Best Places to Live in America 2006". ↑ Santa Rosa is the largest city in California's Wine Country and the Redwood Empire . The county seat of Sonoma County since 1854, it grew as a center of agriculture, shipping, and industry. It is today still an important local center of business and tourism. The city actually suffered the most destruction of the 1906 San Francisco earthquake, which destroyed Santa Rosa's entire downtown. Notable residents have included famed horticulturalist Luther Burbank and Peanuts cartoonist Charles M. Schulz. ↑ Ontario is the third principal city of the Inland Empire area of California, home to Ontario International Airport and the region's largest shopping mall, Ontario Mills. ↑ Elk Grove was a sleepy suburb of Sacramento until the housing boom of the 1990s and 2000s. Between the decades, the population has nearly tripled from around 50,000 to more than 150,000 inhabitants. The population has grown so much that Elk Grove has surpassed all of the other suburbs in size and inhabitants. The city was rated the fastest growing city in the United States in 2006. About 15 میل (24 کلومیٹر) from downtown Sacramento, Elk Grove has emerged as a popular place for young families to live and commute to the job centers of the area. ↑ Corona is one of the cities farthest west in the Inland Empire of Southern California. It is known as the "Circle City" due to Grand Boulevard's 3-میل (5 کلومیٹر) circular layout. It is one of the greatest residential cities in the Inland Empire, but also has a large industrial portion on the northern half. It is the headquarters of companies such as Fender Musical Instruments Corporation, Hansen Natural Corporation, Watson Pharmaceuticals, and West Coast Customs (featured on MTV's Pimp My Ride). ↑ Lancaster started as a stop on the Union Pacific Railroad, and has grown into the fifth largest city in Los Angeles County. It began as a small farming community, and has since acquired a large and prosperous technology-driven sub-culture. Located in "Aerospace Valley", it has always been on the cutting edge of technology, and is now aiming to become the nation's first net-zero city. ↑ Commonly referred to as the "Aerospace Capital of America", Palmdale is the birthplace of the Space Shuttle, X-15, Northrop Grumman B-2 Spirit, F-117 Nighthawk, Lockheed Martin F-35 Lightning II, SR-71 Blackbird, Lockheed L-1011 Tristar, and many other aircraft that have been used in the United States Air Force, NASA and air forces and airlines around the world. 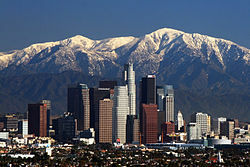 It is the sixth largest city in Los Angeles County and one of the fastest growing cities in the United States. ↑ Salinas is an agricultural center and the hometown of famed writer and List of Nobel laureates John Steinbeck. ↑ Hayward was an historic salt and agricultural processing center. Sea salt brand produced in Hayward were Oliver Brothers and Leslie Salt. In food processing, Hunt Brothers' Cannery (later Hunt-Wesson Foods) produced canned and bottled tomato products, as well as canned peaches, apricots, and fruit cocktail. Since 1957 it has been the home of California State University, East Bay. ↑ Pomona is located between the Inland Empire and the San Gabriel Valley. The city is home of the Fairplex, which hosts the Los Angeles County Fair, the largest county fair in the United States, among others. It is home to the second largest polytechnic university in the United States, California State Polytechnic University, Pomona. ↑ Situated in San Diego's North County region, Escondido is home to the San Diego Zoo Safari Park. ↑ Part of the Silicon Valley, Sunnyvale is home to several large tech company headquarters such as AMD , Yahoo!, and Palm, Inc.
↑ Torrance, 21 مربع میل (54 کلومیٹر2), is situated 11 میل (18 کلومیٹر) south of Los Angeles International Airport (LAX), 8 میل (13 کلومیٹر) north of the Port of Los Angeles, 30 میل (48 کلومیٹر) west of Disneyland and bounded by the Pacific Ocean on the west with 1.5 میل (2.4 کلومیٹر) of beach. Incorporated in 1921, it is the eighth largest city in Los Angeles County, California. Torrance averages 12.55 انچ (319 ملی میٹر) of rainfall per year. 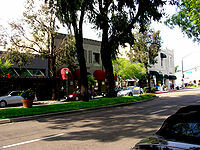 ↑ Pasadena is famous for hosting the annual Tournament of Roses Parade and the Rose Bowl football game. The city is home to many scientific and cultural institutions such as NASA's Jet Propulsion Laboratory, the آرٹ سینٹر کالج آف ڈیزائن, and the California Institute of Technology. ↑ Unusual for cities in Orange County, Orange preserved many of its homes that were built prior to the 1960s, now located in the city's Old Towne District, whereas many other cities in the region demolished such houses in the 1960s. Orange is the home of Chapman University. ↑ Historically, Fullerton was a center of agriculture, petroleum extraction, transportation, and manufacturing. 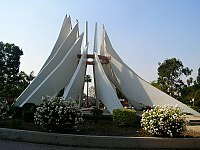 It is home to several educational institutions, notably the California State University, Fullerton and Fullerton College. ↑ Named after the many oak trees that grace the area, Thousand Oaks is the largest city in the Conejo Valley area. ↑ Visalia is the oldest city between Stockton and Los Angeles. ↑ Roseville is a suburb of Sacramento. It is very family oriented with many parks, bike trails, water parks etc., and in 2006 Roseville was named the healthiest city in America. Roseville is known for its high-end shopping including the Fountains, the Galleria (one of the biggest malls in northern California), and more. ↑ Concord is a major regional suburban East Bay center within the San Francisco Bay Area. The former Concord Naval Weapons Station was located to the north of the city. ↑ Simi Valley is a bedroom community located in a valley of the same name. It is the site of the Ronald Reagan Presidential Library. ↑ Santa Clara is located in the center of Silicon Valley and is home to the headquarters of Intel, Applied Materials, Sun Microsystems, NVIDIA, Agilent Technologies, and many other high-tech companies. It also is home to one of the largest theme parks in northern California, California's Great America. ↑ Victorville is located in the Victor Valley, at the southwestern edge of the Mojave Desert. It is the site of the Southern California Logistics Airport, formerly George Air Force Base before it was converted to civilian use. ↑ Vallejo was home of the Mare Island Naval Shipyard, one of the most important naval shipyards in the country, from the 1850s until its closure in the 1990s. It was very briefly the capital of California in 1852. It is the largest city in Solano County, and the home of Six Flags Discovery Kingdom. ↑ Noted as one of the most politically liberal in the nation, the city is home to the University of California, Berkeley, the oldest of the University of California system. ↑ El Monte lies in the San Gabriel Valley region and was formerly a crossroad along the Old Spanish Trail. It is home to Penske Motor Group, one of the largest car dealerships in the world. ↑ Located southeast of downtown Los Angeles, Downey is the birthplace of the Apollo space program and the site of the oldest surviving McDonald's restaurant. ↑ Since its incorporation in 1953, Costa Mesa has grown from a semi-rural farming community to a primarily suburban city with an economy based on retail, commerce, and light manufacturing. ↑ Carlsbad is an affluent, coastal resort city in the North San Diego County region. The city is mainly known for shopping, tourism, a booming high-tech industry, and resort living. ↑ Located southwest of downtown Los Angeles, Inglewood is home of the landmark Randy's Donuts and The Forum arena. ↑ Fairfield is the county seat of Solano County, but not the largest city in the county, which is Vallejo, California. It is the home of Travis Air Force Base and the Jelly Belly jelly bean factory. ↑ Ventura, officially the City of San Buenaventura, is the county seat of Ventura County. Ventura Harbor is home to the headquarters of Channel Islands National Park, and boats to the Channel Islands depart from there daily. 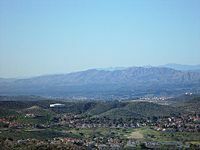 ↑ Forming the southwestern anchor of the Inland Empire region, Temecula is the heart of the Temecula Valley wine region. ↑ Located along the Sacramento–San Joaquin River Delta and known as "The Gateway to the Delta", Antioch is a suburb of San Francisco, Oakland, and the rest of the San Francisco Bay Area. The town has seen an enormous amount of growth in the last 30 years, as the population of the Bay Area continues to grow, and real estate prices force families to move towards the outskirts of the Bay Area. In fact, it is located close enough to the Sacramento Metropolitan area that it can be seen to serve as a suburb of both Sacramento and the Bay Area. ↑ Richmond is located in western Contra Costa County along the eastern shores of San Francisco Bay. It has been called a company town based on its relationship with the Chevron Corporation, and it is the site of the Chevron Richmond Refinery. 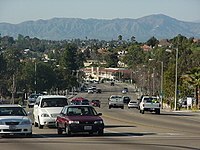 ↑ West Covina is a mostly middle class suburb located east of downtown Los Angeles in the eastern San Gabriel Valley. ↑ Formerly just a small unincorporated town in the Inland Empire, Murrieta has become one of the fastest growing cities in the state. It is now largely a commuter town, with many of its residents commuting to jobs in San Diego County, Orange County, and the neighboring city of Temecula, California. ↑ Norwalk is located southeast of downtown Los Angeles. It is home to Cerritos College. ↑ San Francisco's southern neighbor, Daly City houses the famous Cow Palace (which many people mistakenly believe is in San Francisco), as well as the largest Filipino population outside of the Philippines. ↑ Burbank is nicknamed the "Media Capital of the World"
↑ for being the home of many media and entertainment production companies, including Warner Bros., Warner Music Group, NBC Universal, The Walt Disney Company, American Broadcasting Company, Cartoon Network Studios, and Nickelodeon. 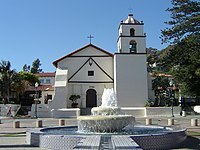 ↑ Santa Maria, the largest city in Santa Barbara County, is in the heart of the Santa Maria Valley wine region and is known for their famous Santa Maria Style Barbecue. Allan Hancock College, and St. Joseph High School are in the city. ↑ El Cajon is located east of San Diego. Nestled in a valley surrounded by mountains, the city has acquired the nickname of "The Big Box". 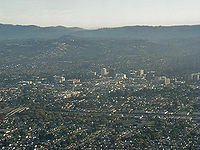 ↑ San Mateo is one of the larger suburbs on the San Francisco Peninsula. ↑ Clovis is the second largest city in Fresno County. Lying at the foot of the Sierra Nevada mountain range, which includes Yosemite, Kings Canyon, and Sequoia national parks, Clovis has been known as the "Gateway to the Sierras". ↑ Jurupa Valley was incorporated July 1, 2011. ↑ An inner suburb of Los Angeles, Compton is known for its large African Americans and Latino communities. The city is home to Richland Farms, one of the last urban farming communities in the Los Angeles metro area, and is also almost universally considered to be the birthplace of gangsta rap. ↑ Vista is located just 7 میل (11 کلومیٹر) inland from the Pacific Ocean in northern San Diego County. The city has more than 25 educational institutions, and a business park home to over 800 companies. 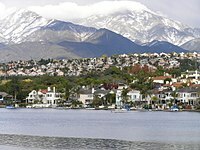 ↑ Located in southern Orange County in the Saddleback Valley, Mission Viejo is considered one of the largest master-planned communities ever built under a single project in the United States. The city is mainly residential, although there are a number of offices and businesses within its city limits. ↑ Located southeast of downtown Los Angeles, South Gate is part of the Gateway Cities region of Los Angeles County. In 1990, South Gate was one of ten U.S. communities to receive the All-America City Award from the National Civic League. ↑ Vacaville is located nearly halfway between Sacramento and San Francisco. It is home to several biotechnology/pharmaceutical facilities. ↑ Carson is a suburb in the South Bay region of Greater Los Angeles Area. It is home of California State University, Dominguez Hills, and the StubHub Center sports complex, housing both of the Major League Soccer teams for Los Angeles, the Los Angeles Galaxy and Chivas USA. ↑ Santa Monica, a famed beachfront city surrounded on three sides by Los Angeles, is home to a mixture of affluent, single-family neighborhoods, renters, surfers, young professionals, and students. It is the site of the world-famous Santa Monica Pier. ↑ San Marcos is a suburb of San Diego and home of California State University, San Marcos. ↑ Hesperia is located in the High Desert region of the Mojave Desert 15 میل (24 کلومیٹر) north of San Bernardino. ↑ Westminster is known for its Vietnamese American community, one of the largest in the United States. ↑ Located on the banks of the Sacramento River, Redding is the largest city in California north of Sacramento. It is the gateway to numerous recreation areas including Shasta Lake, the Trinity Alps, and Mount Shasta. It is also home to the Sundial Bridge at Turtle Bay, the world's largest sundial. ↑ Santa Barbara is a popular tourist and resort coastal city, known for its downtown Moorish-Spanish style architecture, coastal weather, beautiful mountain backdrops, and numerous sandy beaches. The city's economy includes a large service sector, education, technology, health care, finance, agriculture, manufacturing, and local government. ↑ Historically a town with dozens of huge cherry farms and a Spanish missionary ranch, San Leandro today is a rapidly growing city of worldwide industries and a suburb of Oakland. ↑ Chico is the retail hub of the mid-Sacramento Valley and is home to institutions such as Bidwell Park, California State University Chico, and Sierra Nevada Brewing Company. ↑ Hawthorne is a suburb of Los Angeles. It was the home of Brian, Carl, and Dennis Wilson of the Beach Boys. Their boyhood home was demolished in the late 1980s during the construction of the Century Freeway, although it was honored by the dedication of the Beach Boys Historic Landmark (California Landmark 1041) in May 2005. 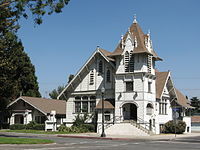 ↑ Whittier is part of the Gateway Cities of Los Angeles County and is home to Whittier College. ↑ Newport Beach is an affluent coastal city in Orange County, known for its beaches and surfing. Newport Harbor is the largest recreational boat harbor on the West Coast. ↑ Located on the eastern edge of San Francisco Bay Area, Livermore is home of Lawrence Livermore National Laboratory and the Centennial Light. It is the largest city in the Tri-Valley area. ↑ Citrus Heights is a suburb located northeast of Sacramento. ↑ Tracy is the second most populated city in San Joaquin County. The city experienced a growth spurt in the 1980s, becoming an exurb of the San Francisco Bay Area as more people looked for a more affordable alternative to Bay Area home prices and a less hectic lifestyle. ↑ Indio is located in the Coachella Valley region of the Sonoran Desert, 23 میل (37 کلومیٹر) east of Palm Springs, California and 134 میل (216 کلومیٹر) east of Los Angeles. Indio and its surrounding communities are regarded as a major agricultural center for Southern California and is the home of the world-renowned Coachella Valley Music and Arts Festival. ↑ Alhambra is located in the western San Gabriel Valley region, east of downtown Los Angeles. ↑ Menifee is a relatively new city, incorporated in 2008, which includes the communities of Sun City, Quail Valley, Paloma Valley and portions of Romoland in southwestern Riverside County. ↑ Chino and its surroundings have long been a center of agriculture and dairy farming, serving the considerable demands for milk products in Southern California and much of the southwestern United States. ↑ Buena Park, in northwestern Orange County, is home of Knott's Berry Farm and several other tourist attractions. ↑ Hemet, in the San Jacinto Valley, is the home of the Ramona Pageant, one of the longest running outdoor plays in the United States. ↑ Redwood City, the County seat of San Mateo County, is a technology center and deepwater port located on the San Francisco Peninsula. ↑ Merced, in the San Joaquin Valley, is known as the "Gateway to Yosemite"; it is less than two hours by car from Yosemite National Park. The area is also home to the University of California, Merced.